Wethers are awesome. All the goodness (that means non-smelly-stickiness) of a doe, none of the troubles (going into heat, pregnancy, babies, milking) of a doe. Wethers can be incredible companion animals; they can be trained to pull carts. They make great brush eaters and land clearers. Some wethers tend to watch over their fellow goats like a guardian. They are wonderful friends to humans and goats and other animals that are good to them! We've one wether, Coal, who is a permanent farm resident. 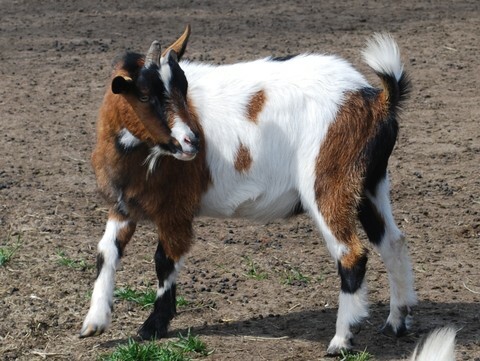 His personality and coloring are like one of our departed, much beloved, first goat's, Travis. So Coal remains as the new kid babysitter, general overseer and self appointed 'what is that you have in your hands?' determiner. Coal about 2 months old. He is making sure I'm not doing anything bad! Comments: Coal is a sweet, mild-manner cutie. He is very even-tempered and not at all uppity. He is naturally polled. He's such a handsome lad! April, 2016. Color: black and brown agouti with liberal white spotting. He's a very good looking lad. Comments: Bandersnatch was an only child. This shows in his size and his original bearing. After being a bit of a snot as a kid, he's become quite the gentleman. He is a very good looking, with at least 3 colors on him. He'd be a good and stable companion for a doe. Comments: This is a nicely sized strong wether with the potential to be very friendly and loving. 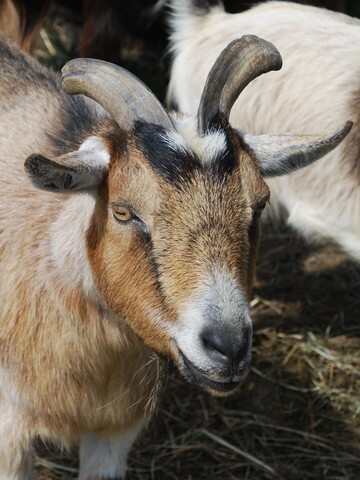 He has some impressive, dulled horns and a nice coloring. He is a bit simple minded and very calm. A beautiful lad, at 1 year old. Color: white, black, lots of grey and grey roaning. Very impressive. Comments: Clooney is left over from a few years ago. He is a special wether, who doesn't seem to know he is not a buck. He has been fully wethered, but he acts like a buck and has long hair and all the usual bucky characteristics. Clooney would make a good companion for a buck in a situation where the buck is kept alone. He would be a good companion for does as well, but he does exhibit buck behaviour, despite his castration. Just born, about 1 hour old. Color: red-brown/black agouti, speckled ears and nose tip. Lots of white on him too. He's absolutely gorgeous and boy does he know it! Comments: Grypon has all the really good and flashy points of a buck but he is a wether. Like the wether Clooney, he tends to have buck behaviours and looks; with a lovely coat, nice form but annoying habits, such as scent marking and bothering the does if he's kept with them. He would be a good companion to other wethers, to bucks, or even to does if he is used to detect heat cycles and so on.